Top Alcohol Funny Car — Sean Bellemeur, Chevy Camaro, 5.460, 268.28 def. Annie Whiteley, Camaro, 5.483, 270.43. Top Alcohol Dragster — Chris Demke, 5.305, 273.33 def. Josh Hart, 5.313, 270.70. 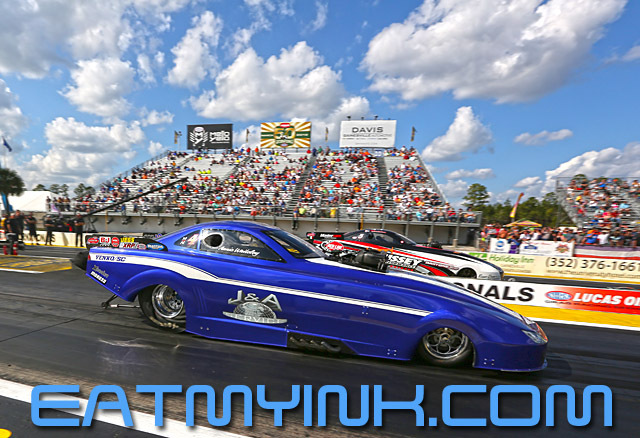 Competition Eliminator — Frank Aragona, Dragster, 7.332, 181.52 def. Greg Kamplain, Dragster, 6.829, 194.02. Super Stock — Kevin Riner, Chevy Camaro, 11.014, 101.01 def. Pat Clifford, Chevy Cavalier, 10.009, 119.96. Brandon Bakies, of Alexandria, Louisiana, the No. 14 qualifier in the 59-car Super Stock field, reached the quarterfinals. Stock Eliminator — Jeff Taylor, Chevy Camaro, 9.816, 129.40 def. Kenneth Miele, Ford Mustang, 8.864, 150.33. Super Comp — Greg Slack, Dragster, 8.911, 170.75 def. Ray Miller Jr., Dragster, 8.910, 185.87. Super Gas — Jim Perry, Chevy S-10, 9.912, 158.69 def. Michelle Furr, Chevy Corvette, 9.933, 154.95. Top Sportsman presented by RacingRVs.com — Ronnie Proctor, Ford Mustang, 8.583, 123.64 def. Lester Johnson, Chevy Bel Air, Foul – Red Light. Top Dragster presented by RacingRVs.com — Alan Kenny, Dragster, 6.291, 188.75 def. Steve Cohen, Dragster, Broke. Factory Stock Showdown — Stephen Bell, Chevy Camaro, 8.176, 167.47 def. Aaron Stanfield, Camaro, 14.967, 77.46. Leah Pritchett was first off of the starting line in two rounds of Factory Stock Showdown competition. Despite her reaction time advantage, her second round opponent Randy Taylor, of Artesia, New Mexico, was able to take the lead and cross the line first, ending Pritchett’s first Factory Stock Showdown event of the year with a quarterfinal finish. Chevrolet COPO Camaros comprised the whole semifinal field of the Factory Stock Showdown. Stephen Bell of Shreveport, Louisiana, defeated Leonard Libersher of Wilmington, Illinois, in one semifinal. Aaron Stanfield of Bossier City, Louisiana, defeated Taylor on a holeshot in the other semifinal. David Barton of Robesonia, Pennsylvania, driving a Gary Wolkwitz-owned Chevrolet COPO Camaro, was the No. 1 qualifier. Barton won the Gainesville event in 2017 on the way to earning the series title.